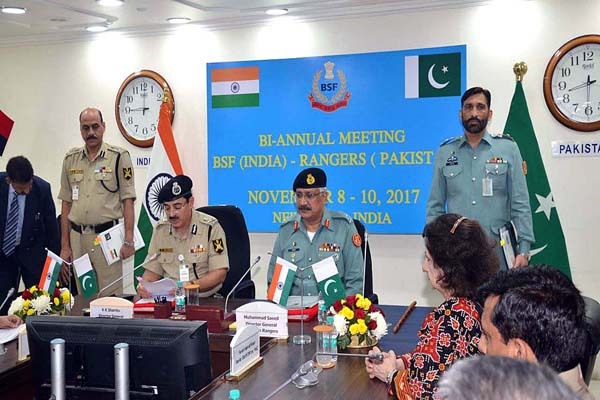 ISLAMABAD, Nov 10 (APP):Pakistan Rangers and Indian Border Security Force (BSF) Friday discussed measures to effectively check the smuggling and border crossings from both sides of India and Pakistan. Both forces agreed to encourage local commanders at junior level to mutually resolve the minor issues, related to border management at post, company and battalion level. The meeting was held in highly congenial and conducive atmosphere. The meeting is held alternately in Pakistan and India, on yearly basis. Three days 44th meeting between Pakistan Rangers and Border Security Force (BSF) concluded at New Dheli on Friday. It was also discussed that Ceasefire Violations (CFVs) and unprovoked firing results in loss of innocent lives. At many occasions, women and children also become the victims. To overcome this ordeal, both border guarding forces need to revive the spirit of 2003 Cease Fire agreement. In order to address the miseries of inadvertent border crossers and fishermen detained in Indian Jails due to lengthy and complicated repatriation process, both sides explored fresh ideas to expedite the legal formalities with an intent to reunite the affected families with their loved ones. Issue of defence construction closer to Working Boundary and International Border have also been deliberated upon to find out amicable and prompt solutions for addressing the day to day mutual concerns. The outcome of this meeting will be beneficial to both the countries in general and border guarding forces in particular.